It’s amazing that children ever managed to survive the 50’s. Between the shoe fitting x-ray unit that leaked radiation so badly it caused brain cancer, the skull impaling lawn darts, children must have been dropping like flies. Luckily, the most questionable item out there, the Gilbert U-238 Atomic Energy Lab, was only available for about a year. 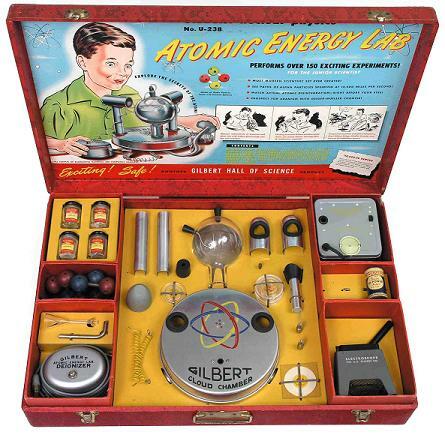 Yes, for the low low price of $50, your budding young Feynman would get a kit containing a Geiger counter, a Wilson cloud chamber, a spinthariscope, three illustrated books (including “Dagwood Splits the Atom”) and three highly radioactive ore samples. Despite being billed as Exciting! and Safe! I have my doubts. It’s amazing how misunderstood radiation was, and sometimes I find it remarkable that kids didn’t either become sterile, or blow themselves up.